Claire Miller Legends, 3 years Baritone 1. Find the corps that is best for you. The decision to join a drum corps starts with passion for the sport and the music. You really need to love it. Consider the start schedule to make sure it fits with your schooling, the home location for ease of getting to the rehearsal camps, and most important of all, the mission statement and philosophy of the corps. You want to be part of a group that has a vision and goals that are aligned with your own and that "feels" right, too. Interview the director when you are looking for your best fit and to see what the vision is for the future of the organization. There is a group for everyone. Find the fit. 2. Even if you are not sure, take the plunge. Even if music is your passion, you will most likely have some anxiety, maybe an all out fear about auditioning. I can tell you that being in a corps is going to change your life, and if you do not try, you will always wonder and wish. My own story really backs that up. I had been attending DCI events for years as a fan, loving it and bemoaning that I was a woodwind player. In high school I was a drum major, but I had no real marching experience because my band didn't compete. I was determined to do drum corps, but I had no idea how to make it happen. Immediately after my high school graduation, I found out about Legends, a corps that was literally in my backyard at college. I was willing to do anything and learn anything, and called them up after reading about them and researching. I was reassured that if I had the attitude and drive to make it happen, that attitude was just as important as musical skill. One week later, I was at spring training to audition, without knowing an instrument, the music, or how one possibly would "hit dots." With their help, I found my place in the horn line as a baritone player. Everyday I was auditioning and I worked hard to learn a new instrument, new music, new dots, and adapt to a new summer lifestyle. They had faith in me, no matter how hard it was for me to push through, and I took the leap. 3. Go to the camps. If I could do it over, I would have attended camps before move-ins during the off-season. This is where you can see how corps life is. Camps are where a lot of the work takes place to get you ready musically, mentally, physically and emotionally. You begin to mesh with this new family of yours and see the teaching styles that are used. You learn how to sleep on gym floors, power through rehearsal when you are tired, and most importantly how to live by a schedule. It ultimately makes your summer easier. Do them all, especially any "experience" camps if you are new to drum corps or just thinking about joining a different corps. 4. Be motivated and coachable. Like any other team sport, it takes each member doing her/his part to make it work. Maintaining a positive attitude, working hard (and you WILL work hard) will pay off. The satisfaction and adrenaline rush of getting what you have spent hours each day perfecting, revising and relearning on the field is awesome. Some things will challenge you more than others, and you won't be the only one. The only way you can conquer the difficult parts of a show is to work together to find how to make it "click." You have to be ready to be part of a team effort and check your ego at the door. You are with this team 24/7 for weeks on end, and being able to adapt and be flexible is imperative for a successful season. 5. Be prepared. This is another one of those "I wish I knew" items. Going into my first season, I didn't know how drum corps would affect me emotionally or physically and this made it extremely difficult. However, I ended that season with Legends leaner, stronger, with greater physical endurance than ever before, and I knew what to expect for the next season. I have since made it a priority to keep strong and exercise. I became more focused and learned better organization skills. Best of all, I learned that although it is easy to quit, it is more empowering and rewarding to stick with it. Never give up. Never surrender. I am proud to be a strong, powerful Legend. 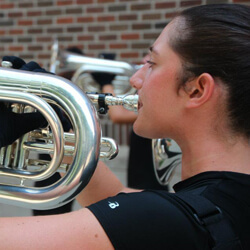 View additional audition tips, and learn more about corps audition dates, locations, and more.